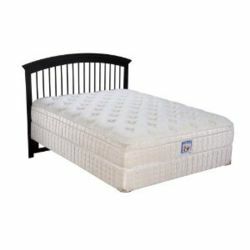 Serta is a private company with headquarters in Illinois and it manufacturers a wide range of popular mattresses. It was formed over 75 years ago when a consortium of some 13 mattress manufacturers came together and organized themselves under the name of Serta. Today the company is still going strong and is a very well known brand for mattresses. This mattress delivers full body support through its 532 individual coils (support is often a function of the coil count, coil gauge and coil construction – among other things). The coils in the Shyreton are “twice-tempered” for strength. Serta claims that this mattress will reduce the normal restlessness that may occur when sleeping with a partner. The Shyreton has a three-beam support base (for durability) and the mattress is just over 13 inches in height. The Serta Shyreton Pillow Top Mattress also has a hypoallergenic cover made of a cotton and polyester blend that meets the standards for fireproofing under the TB603 California fire code standard. The TB603 code from the State of California is considered to be the most stringent in the United States. The Serta Shyreton Pillow Top Mattress is available in standard sizes from Twin to the California King and it costs are in the 1000USD range. It comes with a ten-year warranty (on manufacturers defects). Many people search for the perfect balance of leg and spine support, but still want a reasonably soft mattress. The Serta Shyreton Pillow Top mattress is designed to address this need. It is considered to be a firm mattress (and provides good support), but also has the feel of a softer mattress because of the pillow top feature (an additional layer of soft upholstery on top of the mattress). While this mattress cannot be flipped, it can still be rotated to prevent the indentations in areas of heavy use (Serta recommend rotating the mattress about every six months to compensate for normal wear and tear). Also, the Serta Shyreton Pillow Top Mattress can be vacuumed to remove dust, hair, and other allergens without damaging the mattress. While we haven’t tried this we would suggest insuring the brushbar on your vacuum is off. People who purchased the Serta Shyreton Pillow Top mattress generally like it for the extra two inches of foam that help disguise that they are sleeping on a firm bed. However, they did not like the fact that they could only rotate the mattress and not flip it to reduce wear and tear (the pillow top is only on one side of the mattress). Also a number of consumers indicate that they prefer the Euro Top to the Pillow Top. The Euro Top is made of a slightly firmer material and some folks claim it wears better than the Pillow Top.